In Krai Mira, you live in a small village called Quiet Bay. The world around you has been ravaged and is now soaked in radioactive waste and blood. In this post-apocalyptic world, humanity must battle with the environment and with itself. As you head down the shoreline to check the traps, you find out ominous news about an “evil” that is heading in the direction of Quiet Bay. But all is not as it seems, and the ones who are truly evil may not be who you think. Do you have what it takes to survive in this hellish world? 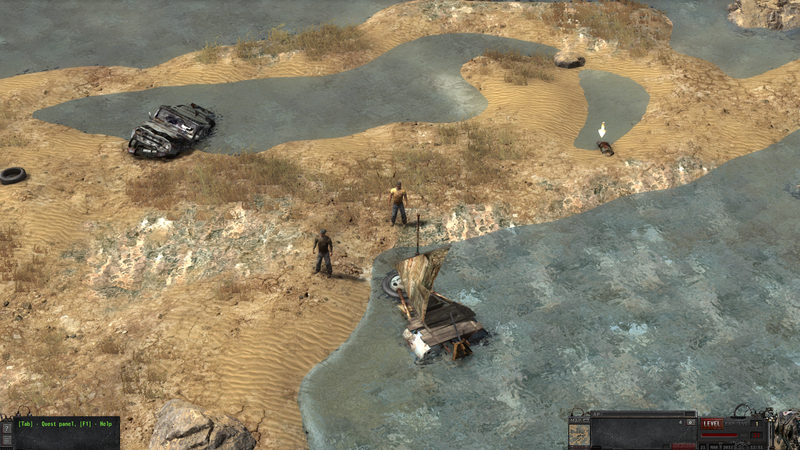 Krai Mira is a single player, post-apocalyptic adventure about surviving and finding out the truth. Soon you’ll find yourself meeting back up with the guy near the start and hopping on the little raft to head home. It seems there is no option but to evacuate your settlement in Quiet Bay to the city for protection. After speaking with an NPC, you’ll be heading out on foot and learning basic combat, but we’ll get to combat in a moment. This is the start of your adventure. The guy in the yellow shirt is you. Walking around is done by clicking on the spot you want your guy to walk to. The small arrow above the bag on the beach is indicating you can interact with it. When you mouse over an interactive object like this, a gear icon will appear. This means you can click on the object to see its inventory. Inside this bag, you will find a couple of starter weapons and items. You will find many things on your travels, but you can only carry a limited amount of stuff in your inventory. Some items have very low weight (like healing items) so you can carry a lot of them. Some have no weight at all, like the 12 caliber ammo you get very early on. 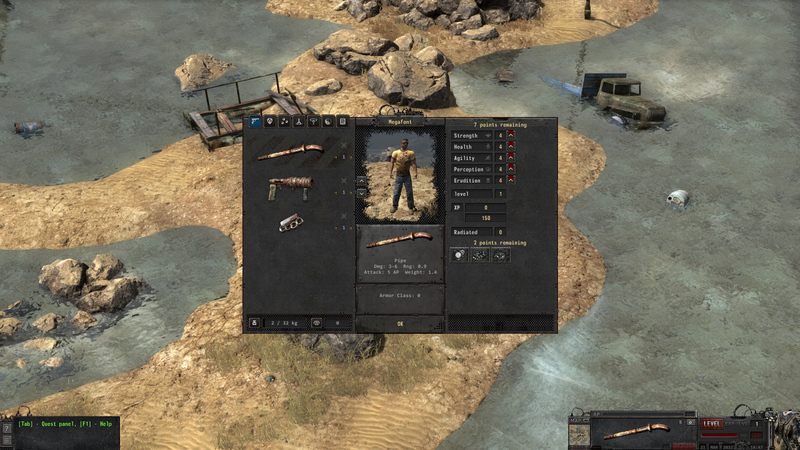 The Krai Mira screenshot below shows your inventory window. You open it by pressing the “I” key, but the game doesn’t tell you that (leaving you to look in the Options screen at the control bindings to figure it out). The pipe with the hazard pattern behind it is the currently equipped weapon. You can also see that there are seven tabs at the top that categorize your inventory. The weapons tab is selected in the screenshot, followed by tabs for armor, ammo, etc. The right pane in this window is where you can spend skill points that you earn through combat. You need to think carefully about how you use your skill points, as they are not something you get all the time. 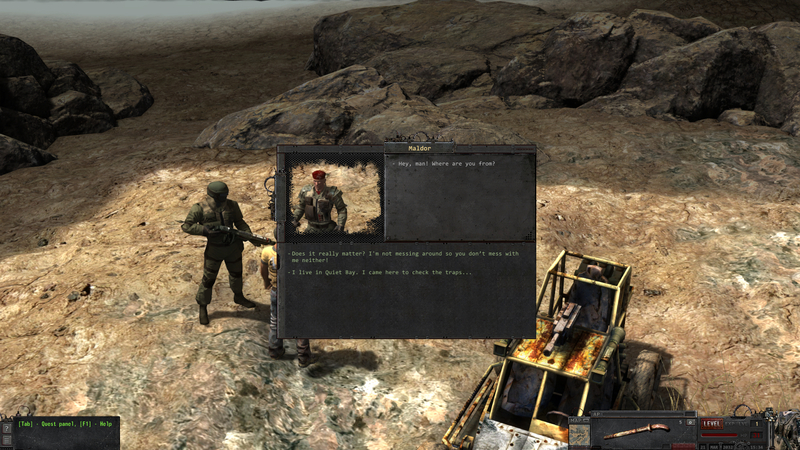 Dialog plays a large role in Krai Mira, so you will see the dialog window often. The screenshot below shows the dialog window in action. The top left of the window shows a thumbnail image of the character you’re talking to. The upper right pane shows what that character is saying, and the bottom portion of the window gives you options for how to respond. These options are generally only used to provide access to different areas of the dialog tree and thus more information for the player. They can aggro a character in some cases, too. Dialog is one of Krai Mira‘s problem areas though, but we’ll get to that in a moment. You may have noticed what looks like an odd shadow with a 90-degree corner in the screenshot below. That’s actually not a shadow. The darker area is land outside the traversable area on this map. Each map in Krai Mira is square shaped and they are all the same size. The maps are generally pretty well detailed, as are most of the object models. You won’t get far before you run into your first combat situation, though. At this point, you have a couple of NPCs following you around. Any time you have an NPC following you around, they will help you if you find yourself in combat. These NPCs can die in combat, and they have permadeath just like you do. The combat system can work in two ways, which you can set in the Options window. It can be real-time or turn based. 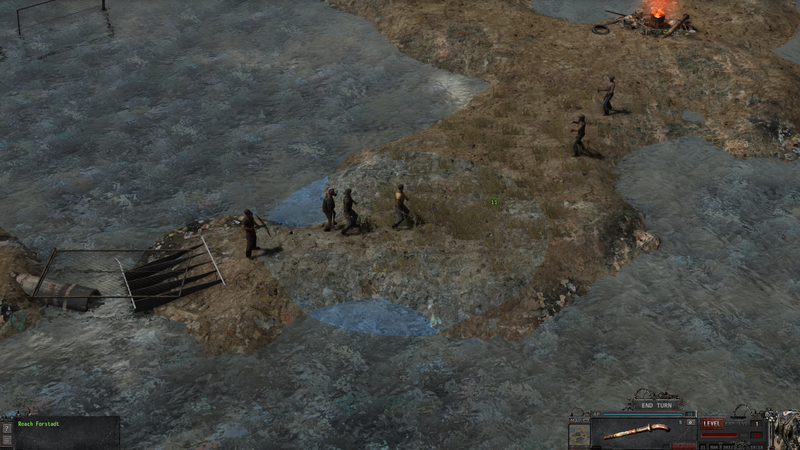 The screenshot below shows the combat system in action. Krai Mira‘s combat system is based on action points. The blue circle around your character shows the maximum distance you can move in the current turn with the amount of action points you have. You’ll probably have to look at the full size screenshot below to see the green number and a line from your character to the mouse cursor. The line shows the path he will take and it will try to path around obstacles if any are present. If combat is set to real-time mode, you can make multiple moves per turn until you run out of action points and your character will do those moves immediately. If you walk a bit, that eats some action points and leaves fewer for attacking in the current turn. Other actions, like looking in your inventory to use a healing item also cost you action points if you do so while in combat. Overall, the combat system feels slow and clunky. Movement is much slower when the game is in combat mode and this becomes annoying in maps with many enemies. The only way to leave combat is to kill the enemies that are trying to attack you, as they will keep following. Into combat: some hostile jerks block your path.